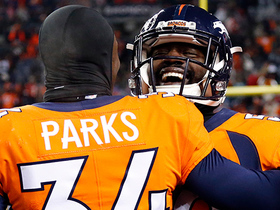 Bray signed a one-year deal with the Bears on Wednesday. Analysis: Bray spent most of 2018 on the Chicago practice squad, eventually earning a promotion to the active roster when Mitchell Trubisky injured his shoulder in November. With backup quarterback Chase Daniel still under contract, Bray figures to enter training camp as the No. 3 signal-caller. The Bears signed Bray to their practice squad Wednesday, Brad Biggs of the Chicago Tribune reports. Analysis: Bray will stick in the organization as a practice player just days after he was dropped from the 53-man roster. The 27-year-old earned a promotion in late November and served as the No. 22 signal-caller for two games while Mitchell Trubisky was sidelined with a shoulder injury. With Trubisky now reasonably healthy heading into the postseason, the Bears will proceed with only two quarterbacks on the roster. Bray was released Saturday by the Bears, Adam Schefter of ESPN reports. Analysis: The move was made in order to free up a roster spot for guard Kyle Long, who was activated off injured reserve Saturday. Bray joined the Bears in November while Mitchell Trubisky dealt with a shoulder injury, but he never played a snap, falling behind Chase Daniels on the depth chart. The Bears signed Bray off their practice squad Wednesday. Analysis: The roster move provides another hint that Chase Daniel will replace the injured Mitchell Trubisky (shoulder) as the team's starting quarterback Thursday in Detroit. 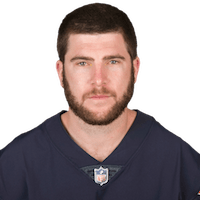 The 26-year-old Bray previously worked with coach Matt Nagy from 2014 to 2017, mostly serving as the No. 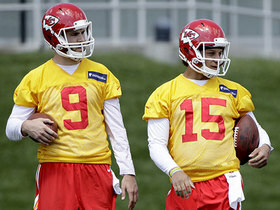 3 quarterback in Kansas City. Bray has attempted just one pass in an NFL regular-season game. Bray signed to the Bears' practice squad Monday. Analysis: The longtime Chiefs backup moved to Chicago this offseason, but he ultimately failed to secure a role on the 53-man roster. He'll remain with the team as a member of the practice squad, where he could potentially be called up to the active roster at some point this season. Bray signed a one-year contract with the Bears on Friday, Larry Mayer of the team's official site reports. Analysis: Bray has spent his entire five-year career as a backup with Kansas City and will now follow ex-Chiefs offensive coordinator and current Bears head coach Matt Nagy to Chicago. He'll initially slot in as the third quarterback behind Mitchell Trubisky and Chase Daniel. Kansas City Chiefs fullback Anthony Sherman mishandles hand off and the Denver Broncos pick it up for a touchdown. NFL Network's James Palmer reports from Kansas City Chiefs training camp about the competition for the team's backup quarterback position.